Thank you for being so patient for the next block in the Vintage Block Quilt Along. I'm way behind but I promise there will be 12 patterns total!!! I was acceped as a contestant for "Sew Mama Sew" - The Super Online Sewing Match and I've made it to the final round, so I've been busy with that! It has also been an incredible summer here in Seattle so the boys and I have been exploring our beautiful city and surroundings as much as possible! The pattern I'm sharing is a Kansas City Star Pattern ~ " Blue Bell ". The first page is the block layout with the sections marked for reference. The second and third pages have the pattern templates and the fourth page contains the optional "window box" center square pattern. Spray Starch - so helpful to get out the creases on curved seams!!! 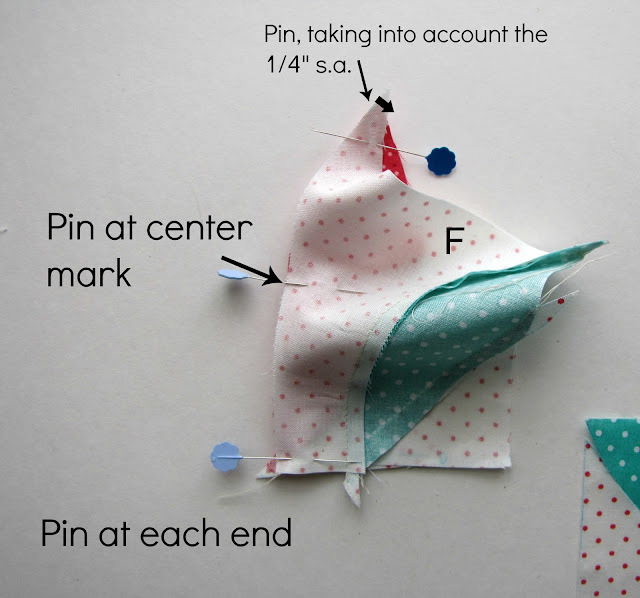 Note: All seams are 1/4"
4 each pattern piece. Accurate cutting is important!!! 1 - 4 1/2" x 4 1/2' square for center - or various scraps to create the "Window Box" center square. Window box pattern is page 4 of the PDF pattern. It is a foundation paper piecing pattern. 3. Divide the larger block into 9 - 4 1/2" block. 4. Creating The Leaf Sections. 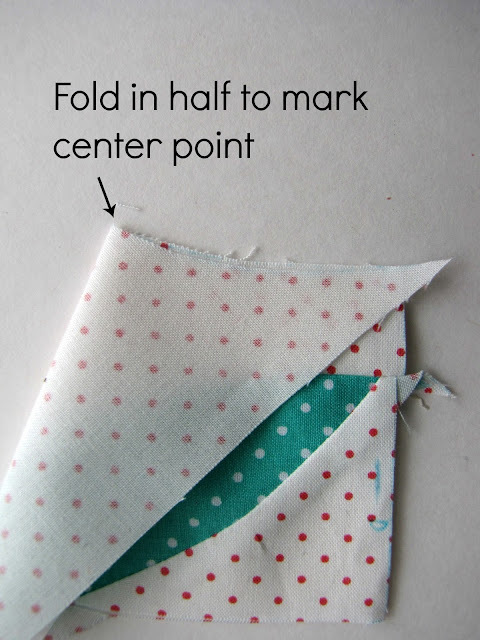 Fold each seam in half and find center, finger crease. Pin in center and edges. 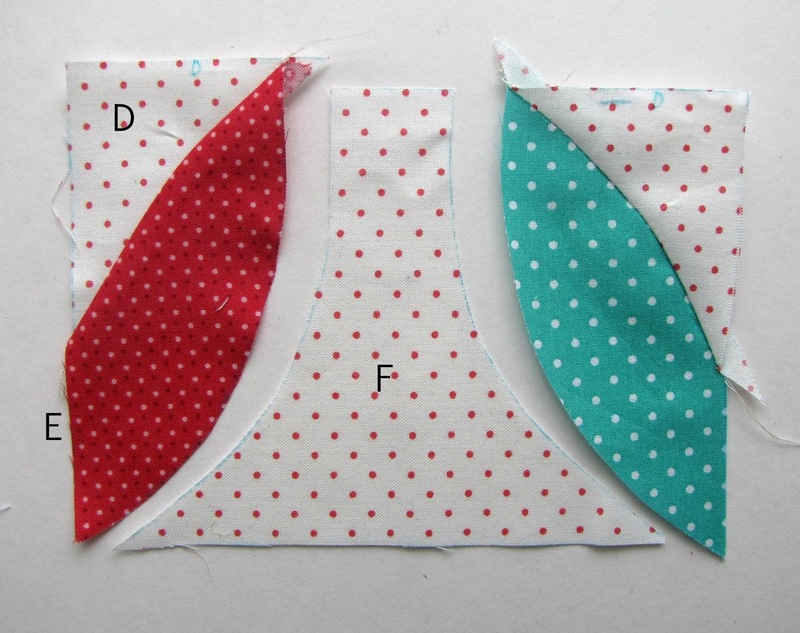 Stitch on the inside curved edge - in this case - D.
Fold E in half and crease to mark. Fold D and F in half and crease to mark. 6. Pin D to F at the center and each end taking into account your 1/4" seam allowance. Stitch on the curved inside edge - piece F.
7. Create the flower blocks. 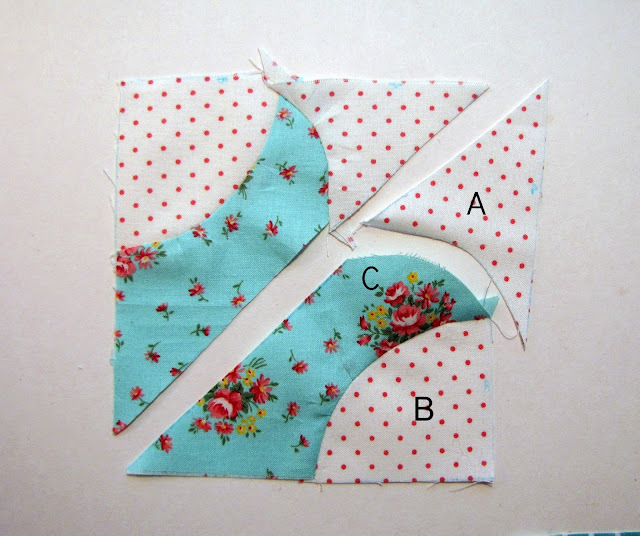 Stitch B to C, folding each seam in half (see step 5). Pin at center and edges taking into account the 1/4" seam allowance. Attach A to B/C. 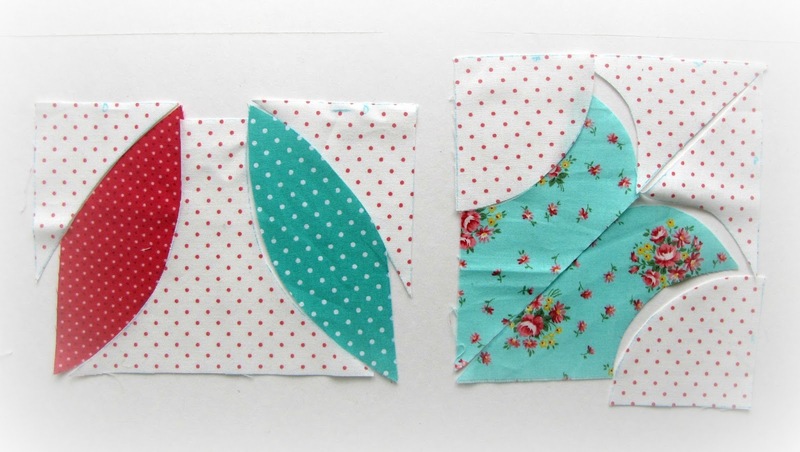 Complete by stitching both sides of the flower together matching seams. 8. Creating the Window Box center square - optional. Refer to the pattern on page 4. Foundation paper piece the square or cut each template and add 1/4" seam allowance. - Stitch the top row of three blocks together matching and pinning seams. Repeat for the center and bottom rows. - Stitch the top row to the center row. Stitch the top and center rows to the bottom row. 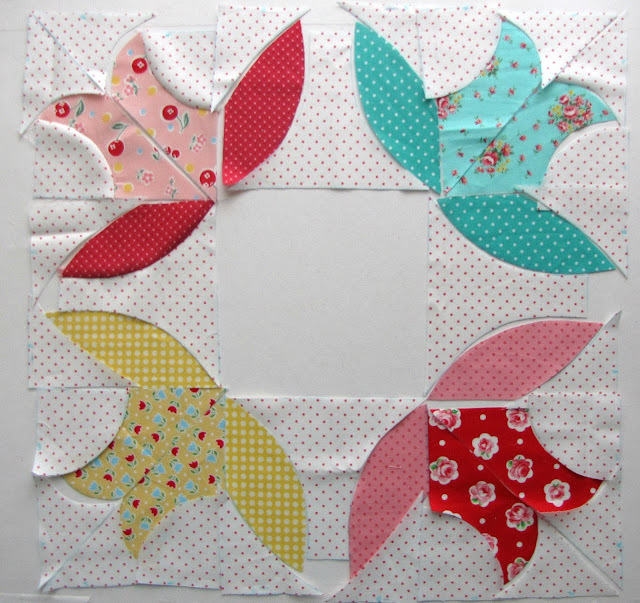 Congratulations - You have completed Block #8 in the Vintage Block Quilt Along!!! Such a pretty block ~ thanks for the pattern and tutorial! 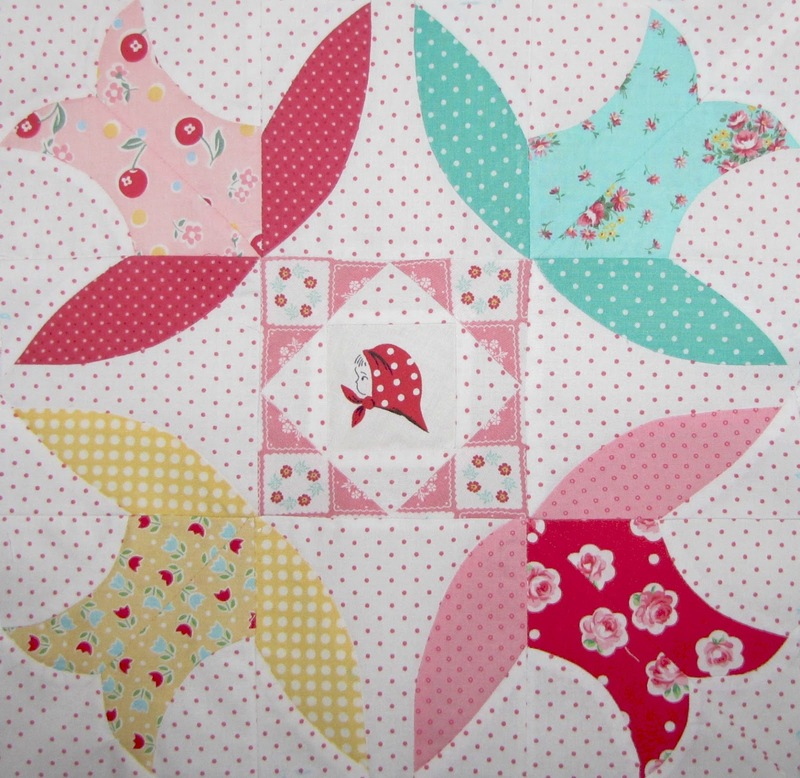 Your blocks are all so beautiful- and the kerchief girl just makes them adorable. I love this pretty block! It does look like a bit of a challenge, but you've given us some great detailed instructions. 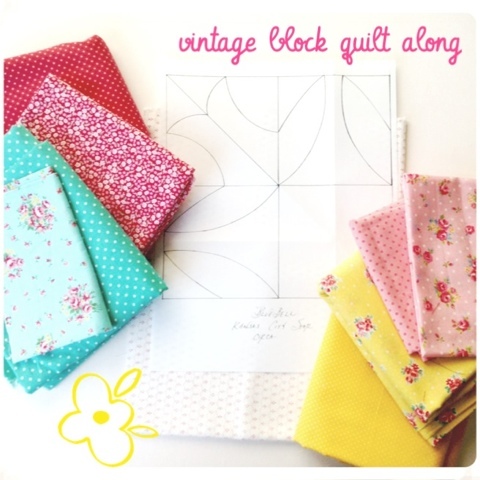 I am behind in my vintage blocks but hoping to get back to my sewing machine one of these days. I miss my quilting! Thanks so much for all the beautiful block patterns, Charise, and I'm wishing you continued success with the Online Sewing Match. This Bluebell block reminds me of little dance costumes with tutus, the old-fashioned kind in a Degas ballet painting. Love it! 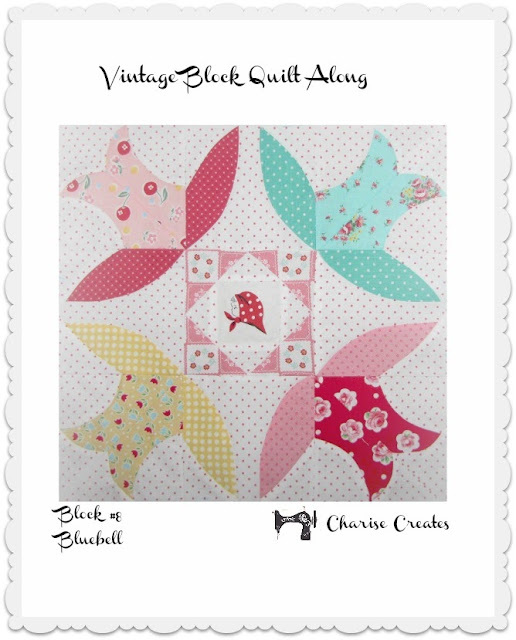 Your Vintage Blocks are lovely, thank you for posting the patterns and the great tutorials. I too have fallen behind and need to catch up. I love this block. I've fallen behind this summer on quilting. It's hard to sew with a broken foot. Fab blocks, excellent instruction. This one will be a challenge - yay!